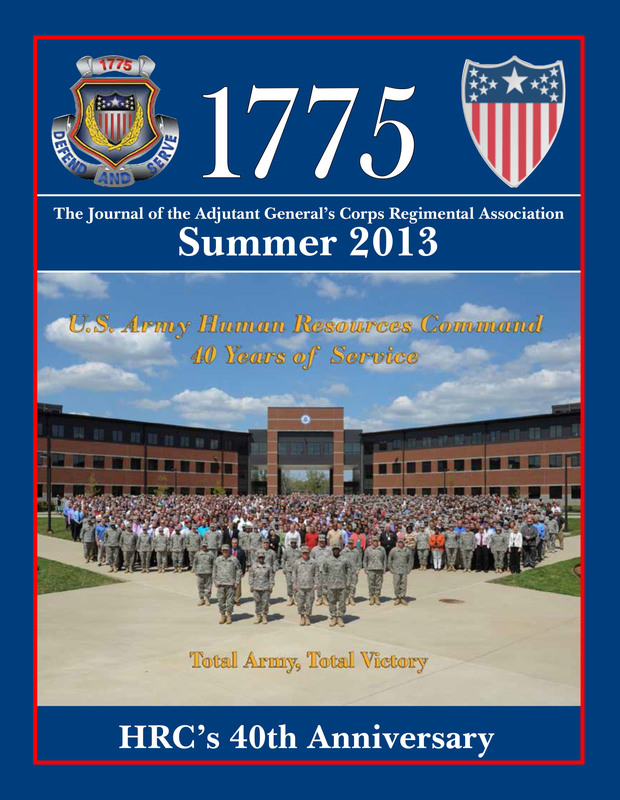 This edition of 1775 is dedicated to ―Human Resources Command‘s 40th Anniversary.‖ From the old personnel automated processing system and punch cards, TACCS boxes, multiple versions of SIDPERS, the current legacy HR systems the AG Corps executes today (e.g., eMILPO, EDAS, TOPMIS, DTAS, DCIPS and iPERMS), to the pending incremental fielding of IPPS-A that will bring all three Army components under one personnel system, HRC has seen it all. Whether you knew the command as MILPERCEN, TAPC, or DA PERSCOM, HRC has been the essence of our Army‘s HR Center of Excellence even before the term was coined. Having served as a Brigade S-1 and Division and Corps G-1s, I came to truly appreciate HRC‘s role and mission in leading the Army‘s personnel readiness mission. Additionally, through HRC mentors, I learned the ―art‖ of not only taking care of my command‘s full spectrum HR mission, but I also learned how to support the wider Army HR mission, which sometimes meant my unit was not the priority depending on what stage of readiness we were in. We hope you enjoy this edition of 1775 highlighted by articles depicting HRC‘s storied history and current HR initiatives today.